Trust innovative Bosch products to get the job done right - at your home or on the job. Choose Bosch Tankless Water Heaters for the latest and finest in technology and design. 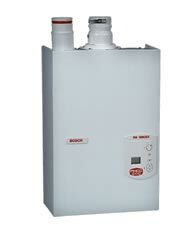 Tankless water heaters are the most efficient way to heat your water. You open a hot water tap, cold water enters the heater and triggers the heating elements or burners. Your hot water tap acts as an ignition key for the energy used to heat only the water you need.